John Pollock's report on the UFC's Fight Night card from the O2 Arena in London with Jorge Masvidal knocking out Darren Till in the main event and a backstage altercation afterward. 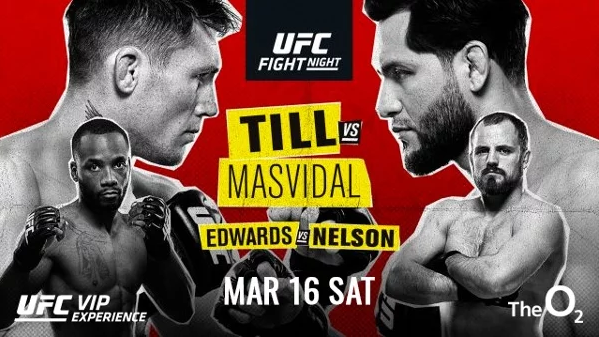 The UFC returned to the O2 Arena on Saturday in London, England for a Fight Night event headlined by welterweights Jorge Masvidal and Darren Till. The main event earned “Fight of the Night” honors as Masvidal knocked out Till with one of the best knockouts this year. Masvidal took home $100,000 in bonus money as he also received one of the “Performance of the Night” bonuses alongside Dan Ige. Masvidal was also at the center of controversy afterward when cameras were rolling with Masvidal confronting Leon Edwards backstage after the card and threw several punches at the fellow welterweight. ESPN’s Ariel Helwani reported that local police were investigating the incident and showed up at the fighter hotel in London. Edwards’ management put out a statement that the fighter was fine. Helwani added that Roberts will not be pressing charges. Grundy won the first round by controlling the standup and got a takedown. In the second round, Narimani began landing with counters and stunned Grundy with an overhand right to the side of the head. Grundy responded and dropped him with a left as Narimani was rocked and trying to survive but he was stopped with strikes. Grundy improved to 12-1 winning his UFC debut. McCann is a former Cage Warriors flyweight champion and lost in her UFC debut in this same building. McCann won the first two round after nearly catching Cachoeira with a submission in the first. In the second, she tagged her with a right and continues to land throughout the round. In the third, Cachoeira shut McCann’s left eye and it looked brutal with the concern she may have broken her orbital. The doctor allowed McCann to continue and Cachoeira won the round but lost the fight. I had it 29-28 for McCann. Ige clipped him with a left hand, Henry went down as Ige took the back and submitted him with a rear-naked choke. Ige has won three straight in the UFC. Dan Hardy and Paul Felder were appalled at Safarov in the first-round for the constant fence grabs and then not stopping his striking when referee Leon Roberts tried to call a break in the action. Safarov was deducted one point for the fence grabs. I still had the round 9-9, so Safarov would have won the round. Safarov dominated Negumeranu in the second round with tons of ground and pound before mounting him and landing elbows. In the third, Negumeranu’s right eye was swollen badly. Safarov got a body lock takedown and dominated Negumereanu inside of his guard. I had 10-8 rounds in the second and third, so it was 29-25, but most only had one 10-8 round. This was Safarov’s first UFC win. This was an excellent performance from Diakiese, who came into the fight with three straight losses and was facing the possibility of being cut if he lost a fourth time. Diakiese used low calf kicks early on in the fight and dropped Duffy with a left elbow to win the first round. Diakiese took Duffy down in the second round and the Tristar fighter was cut by the right eye. Diakiese continued with the takedowns. Diakiese controlled him on top and fought a smart fight but it wasn’t a dull affair, he looked very good against a quality opponent. Diakiese could barely speak after the decision was read as he was crying and Dan Hardy tried his best to interview him, it was a very emotional scene. You should never take for granted the emotional toll and pressure these fighters place on themselves knowing they could lose their job with a bad performance. This was not a very entertaining fight as Allen fought at distance and had a strategy of going all out in the final seconds of each round to solidify them. Allen was ahead on distance strikes and attacked the body as part of his game plan. Allen was quick to counter when Rinaldi missed. I felt Allen clearly won each round but there was a judge who gave a round to Rinaldi. Allen’s record is now 14-1 and is 5-0 in the UFC. His drawback has been his infrequency of fights. Prior to entering the UFC, he fought four times in 2013 and another four in 2014. Since June 2015, he has fought once per year in the UFC. Marshman missed weight by two pounds and was deducted 20% of his purse. Phillips dropped him in the first round but instead of following up, he took a bow and let Marshman up and he seemingly recovered. I had it even after two rounds with Marshman winning the second round after circling and landing as Phillips was less frequent with his striking. Phillips also went down momentarily from a body kick. In the third, both respected the other’s power, but it was Phillips delivering more kicks and jabs and having success with them. There were a pair of left hands by Phillips and I had him winning 29-28 and was pretty convinced of that score. This was an entertaining fight with Silva determined to get this fight to the ground and was aggressive with his submission game. Silva mounted Roberts in the first round and went for an arm triangle that Roberts reversed out of and got top position. Silva still won the round. Roberts connected with an overhand right in the second round, so Silva took him down in response. Silva mounted him again and Roberts almost got out, but referee Kevin Sataki gave Silva the position back because he ruled that Roberts used his toes in the fence to get the momentum. Roberts broke out of another arm triangle and is on top. This was a great round, I had Silva up 20-18 after two. In the third, Roberts rocked him, Silva was down, and Roberts landed elbows on top. Silva grabbed the arm from his back and Roberts attempted to slam him, but Silva extended the arm and the referee called the fight off due to a verbal submission. Roberts was interviewed and claimed he may have grunted but he didn’t submit and believed he was free of the armbar. Silva is now 4-0 in the UFC and has won 13 straight since losing in his pro debut in November 2007. Wood trains under former UFC and WEC fighter Brad Pickett. Wood won the first round after working for a D’arce choke and securing a body lock takedown at the end. In the second, Wood got another takedown and moved to half-guard, took Quinonez’s back and locked in the submission for the tap. Wood is now 16-3 and they were talking about him as a big prospect to watch at 135 pounds. On paper, this will be a good win for Reyes but it was not a great fight and I scored it for Oezdemir. Oezdemir used his wrestling the first while also punching and landing at range. Oezdemir was doubling Reyes in head strikes. Oezdemir threw some looping strikes in the second and I had him up by two rounds going into Round 3. Reyes won the third round by attacking the body. The fight was close enough that you can’t be upset if you scored it for Oezdemir and probably came down to how you scored Round 2. Reyes said he’s coming for Jon Jones as he’s 5-0 in the UFC’s light heavyweight division and 11-0 in his career. This wasn’t the type of performance that is going to propel Reyes ahead of Thiago Santos or Johnny Walker when they are figuring out Jones’ next opponent. Oezdemir falls to 15-4 and has lost three in a row. Nelson got the big body lock takedown at the beginning of the fight, then Roberts reversed and took over. Edwards slammed him down and took the round from Nelson. In the second, you could see a pattern where Edwards would land a strike on the break. Near the end of the round, Edwards dropped Nelson with a brutal elbow strike and nearly ended the fight but he didn’t have enough time. I scored it 10-8 for Edwards. Nelson was the latest fighter on this card to have a possible orbital fracture as his eye looked terrible and was swollen terribly. To his credit, Nelson did a good job and won the third round mainly with his takedown in the final minute and mounting Edwards. Nelson didn’t have time to work his submission game and the fight ended. I scored it 29-27 for Edwards. I was stunned Nelson got one judge to score the fight for him. Nelson absolutely lost the first two rounds. The right guy won the fight. Edwards has won seven straight fights at welterweight. This was an excellent fight and the atmosphere when Till came out was the best fight crowd of the year, thus far. Masvidal ran at Till and accidentally kicked him low in record time, it was within two seconds of the start. Till dropped Masvidal with a left hand and landed a knee as Masvidal got to his feet. Till continued landing with heavy left hands as he placed Masvidal’s back against the cage. Till won the first round. The second round saw Masvidal secure a takedown but Till defended his back. On the feet, Masvidal came at Till and nailed him with a brutal overhand left and Till was out. He took another on the way down and one while on his back. This was one of the best knockouts of the year and will be re-visited at the end of the year. It was Masvidal’s first fight since November 2017 and his first victory since he beat Donald Cerrone in January 2017. This was catapult Masvidal and puts his name into the increasing list of contenders at welterweight.